Investing should be boring but it seems that it’s never boring for too long. There is always an event that can push you to think twice about some of your investment choices. If you have a sound strategy, you should be fine. Do you have a sound strategy? I ran some numbers and my dividend expectations for 2018 has already grown by 8.19% over the past 2 months. Historically, after the new money added and the dividend increases, I have been able to grow my dividend income by 20% annually. Nothing to report on the stock trade front. I expect my tax refund in March and I will deploy it to our TFSA. It’s the best strategy according to the TFSA vs RRSP scenarios. I have just recently reduced my exposure target to the energy sector. With an original 7% target, I needed to have a minimum of 2 stocks to cover the sector and I really could not find any holdings I would want to add after Enbridge. TransCanada Corporation was an option, but I preferred ENB over TRP. 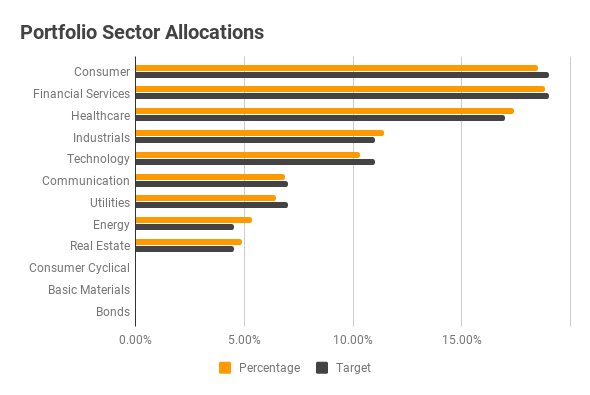 I also prefer other options in a few other sectors like healthcare and industrial. While Enbridge has pulled back, 4.5% per stock is my target and I felt compelled to have Enbridge as my only holding for the energy sector. Why 4.5% per stock maximum? I felt that 5% was too much based on my portfolio size and I already had more than 20 stocks. I may at some point look at 4%. I have 10 stocks over 4.5% and I don’t want to reduce my position while I am still adding new money. To avoid triggering major changes, 4.5% is a good compromise. My February 2018 dividend income is $1,237.99. The second month of the quarter is my lowest. You should see an increasing spread in USD dividend income as I have 55% of my portfolio in USD. It has served me well considering how slow the Canadian markets have been – outside of the banks as usual.